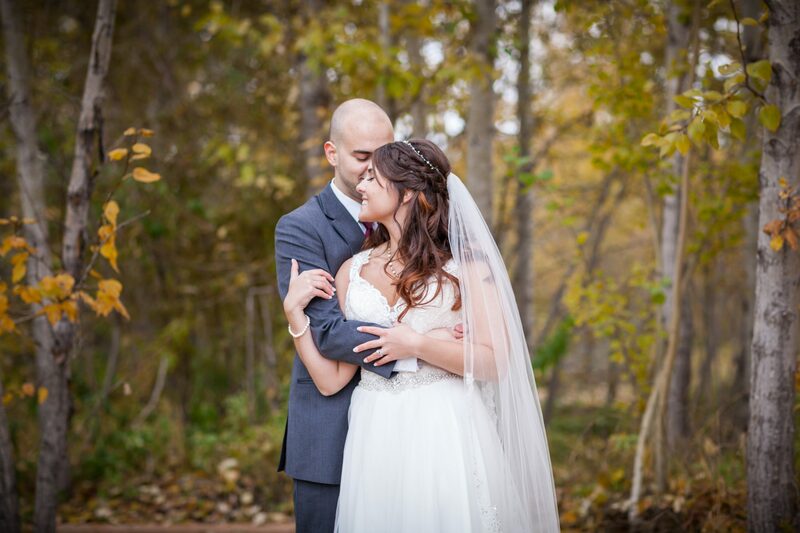 Angela and Christopher’s wedding portrait session at Rainer Gardens was the perfect way to spend a chilly autumn afternoon. 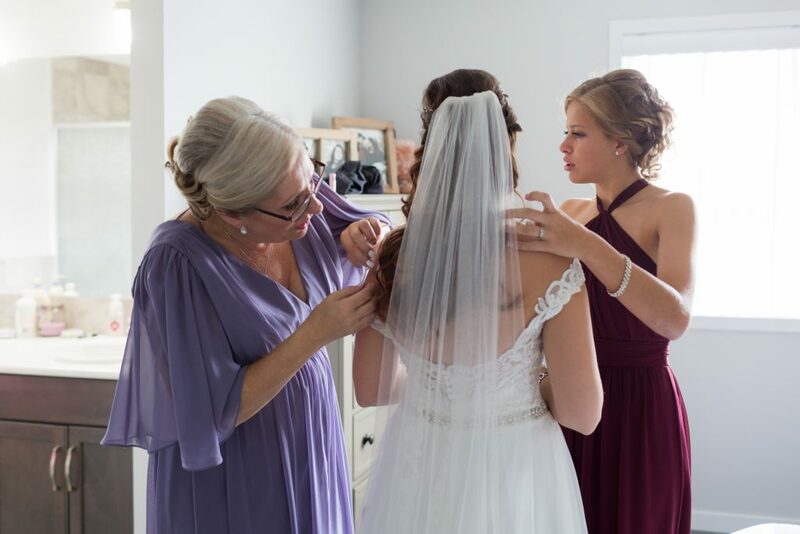 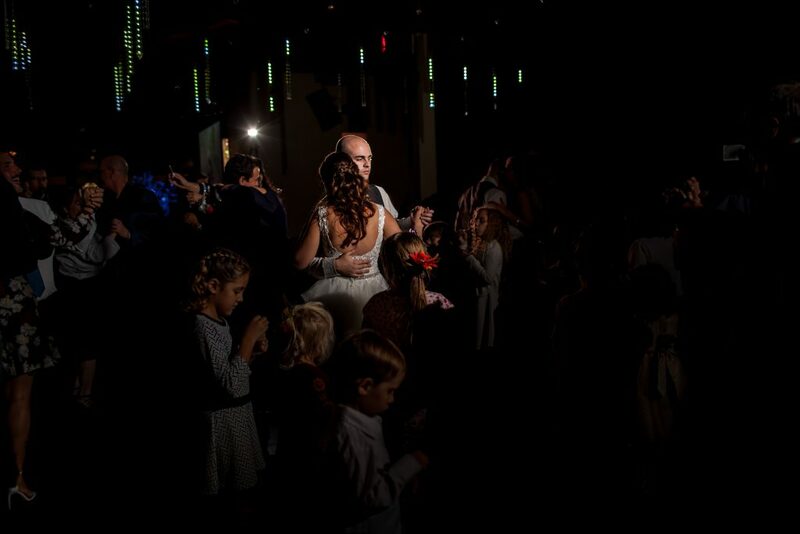 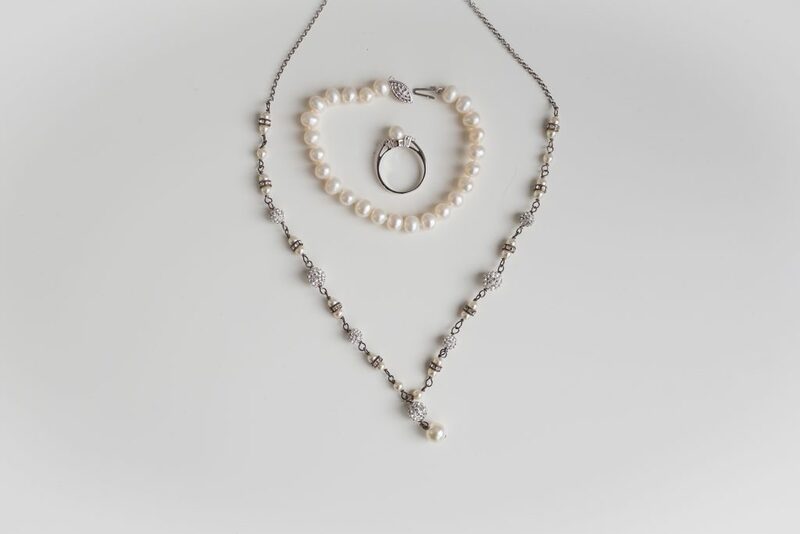 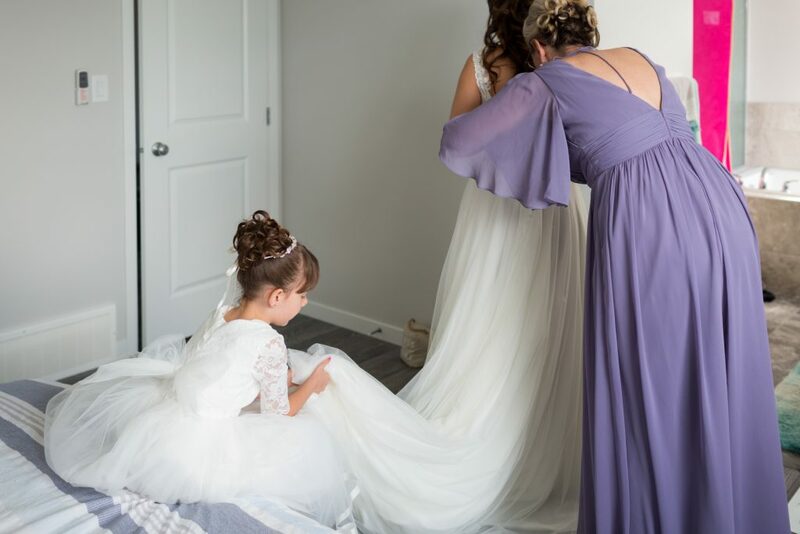 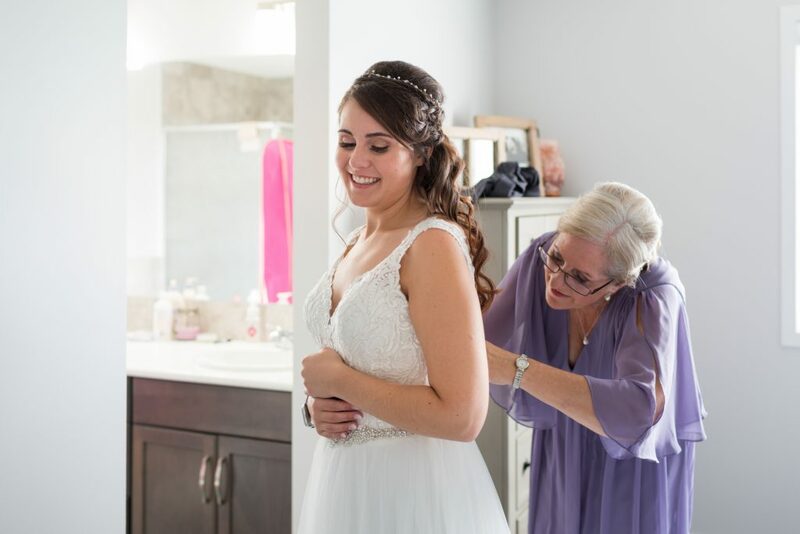 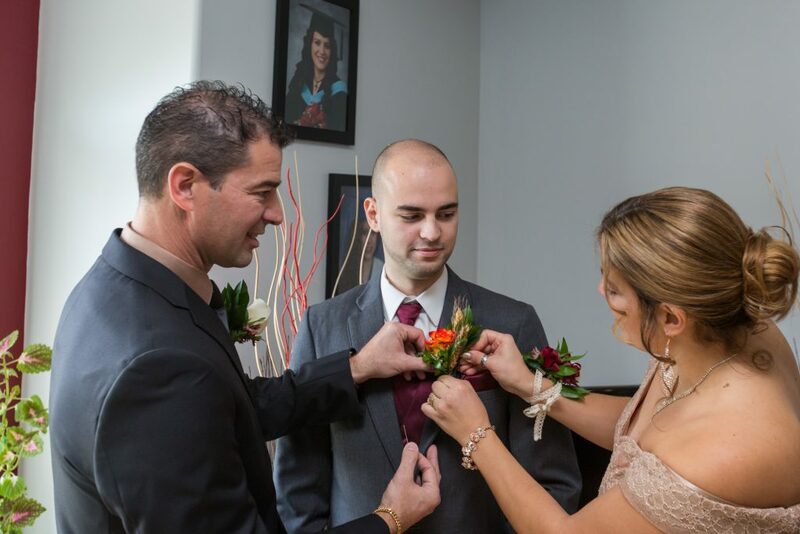 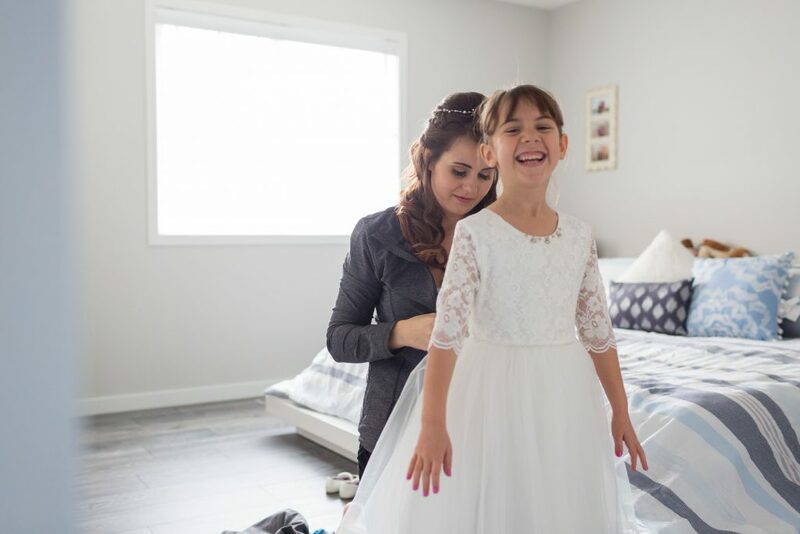 Weddings are all about two families coming together to celebrate the love of their children and the growth of their new family. 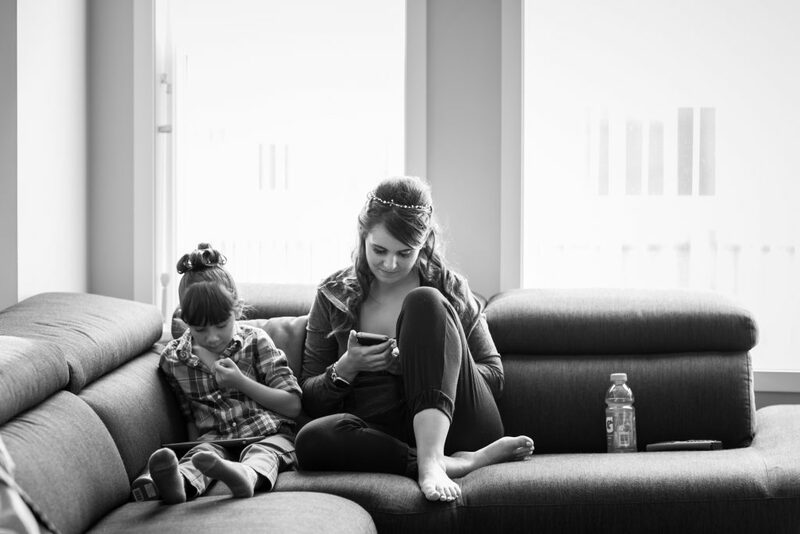 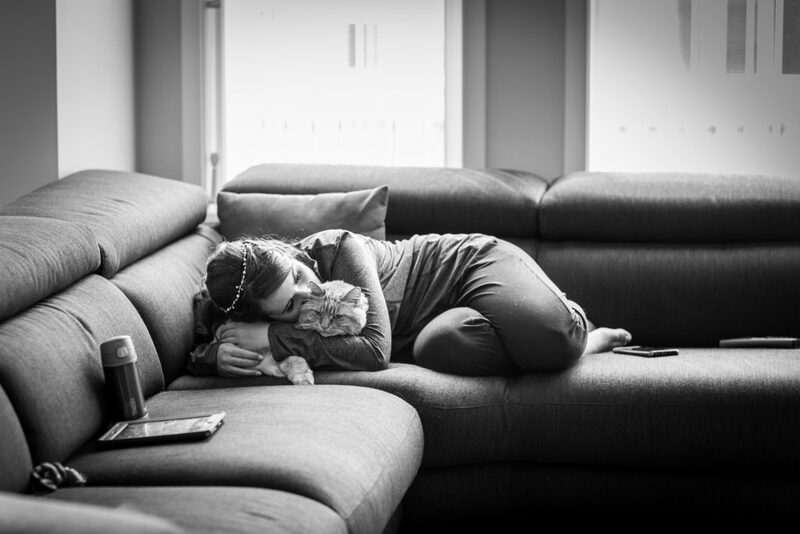 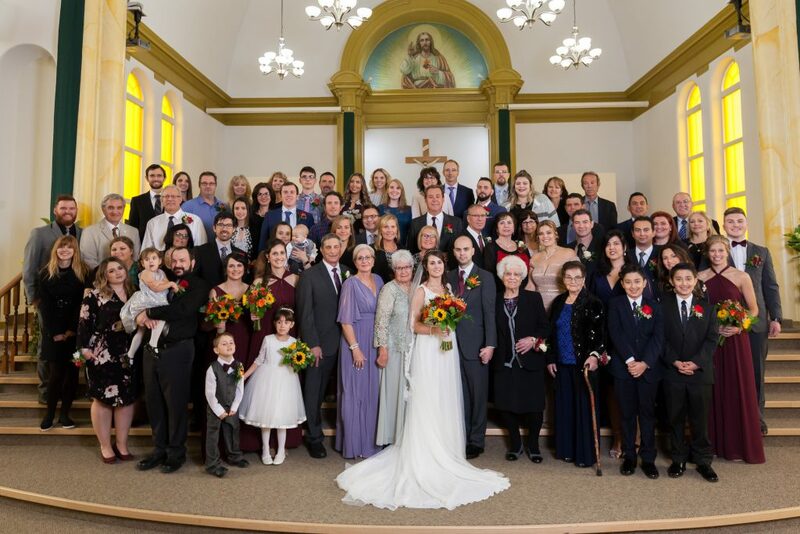 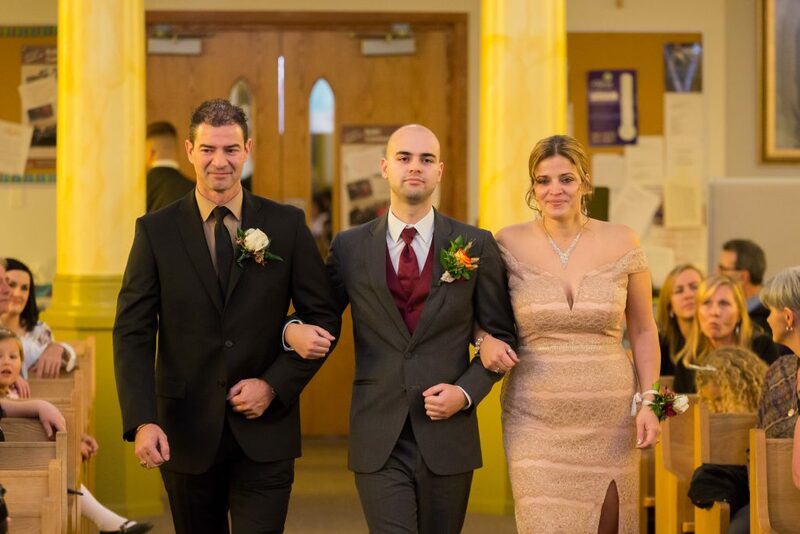 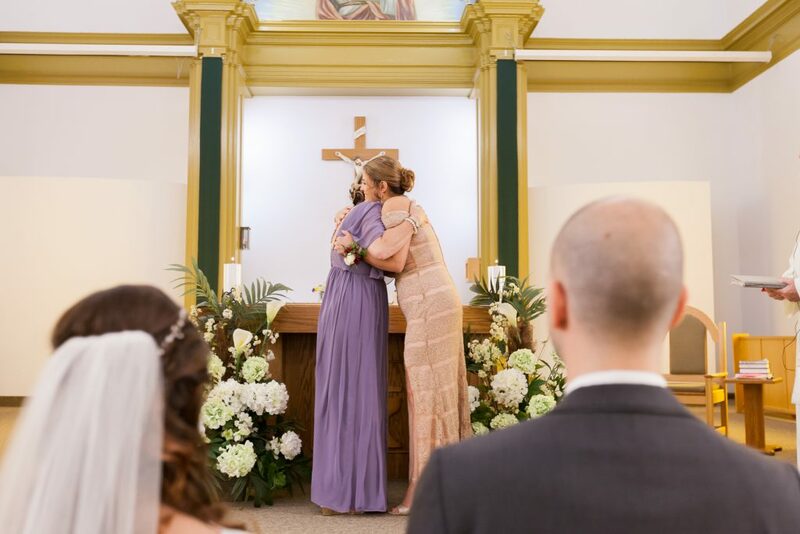 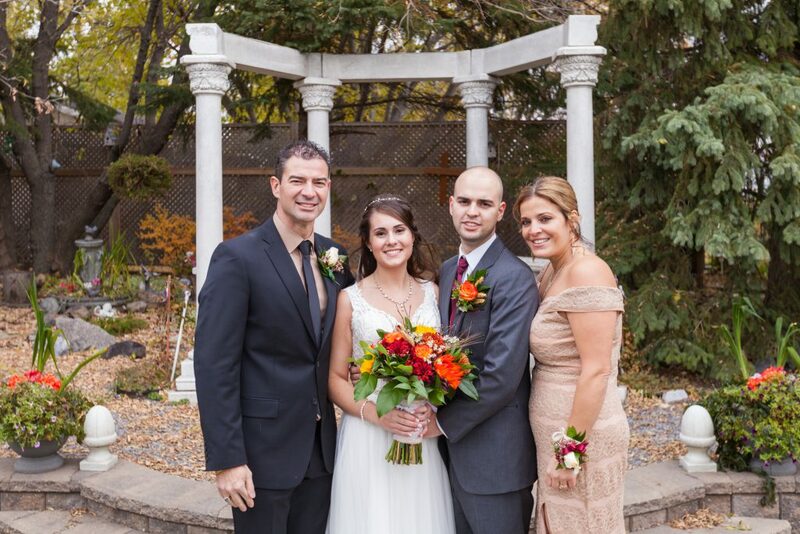 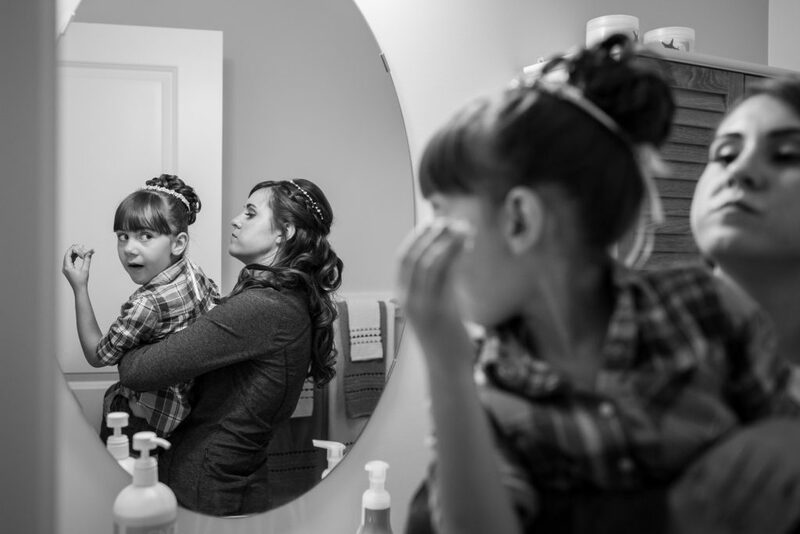 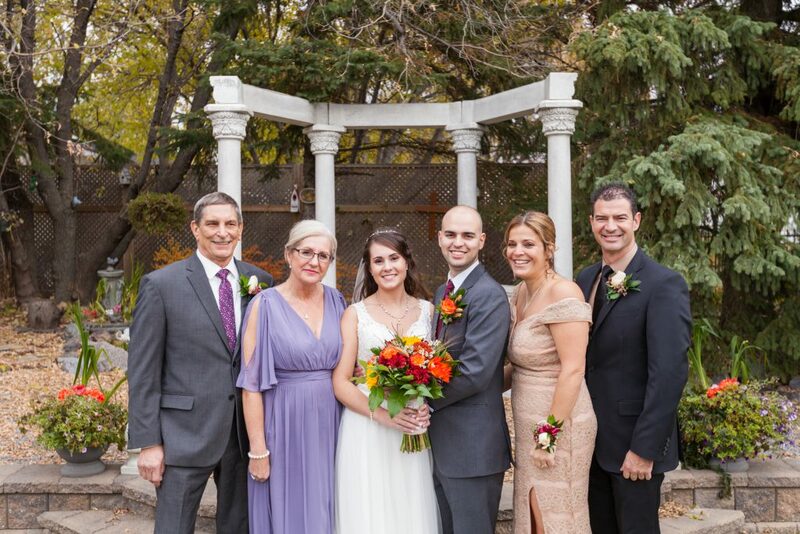 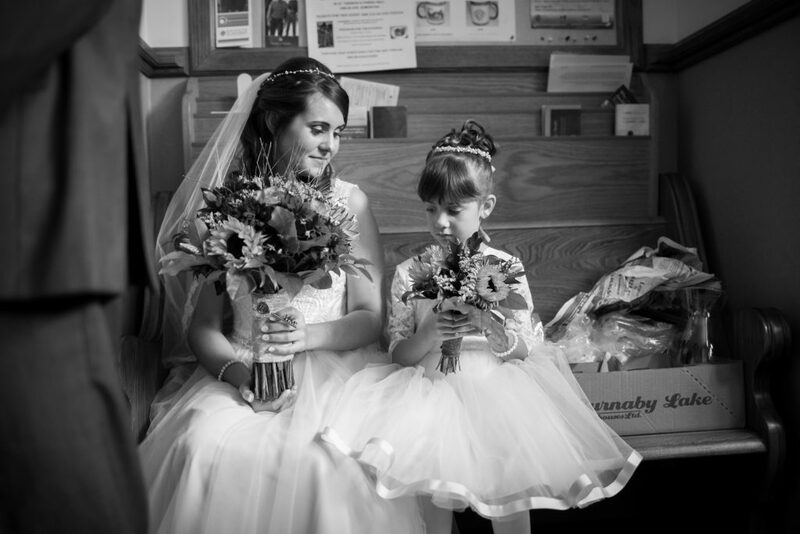 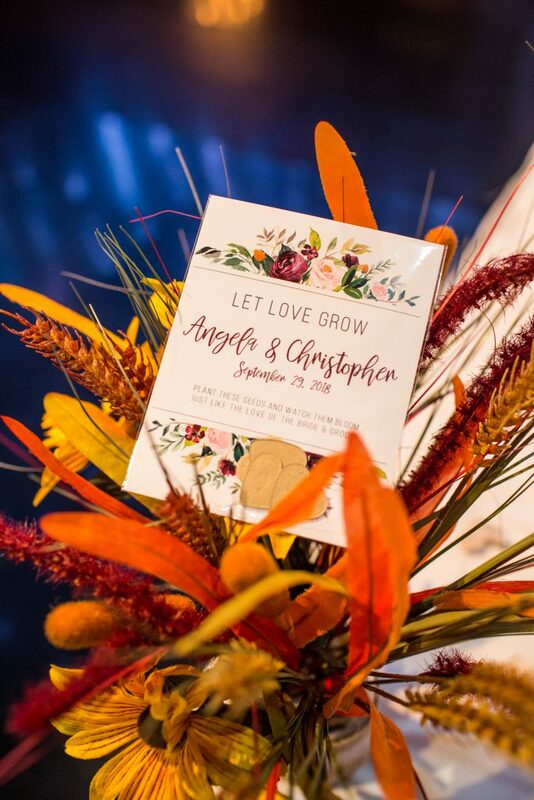 Together, Angela and Christopher brought together two big, beautiful families. 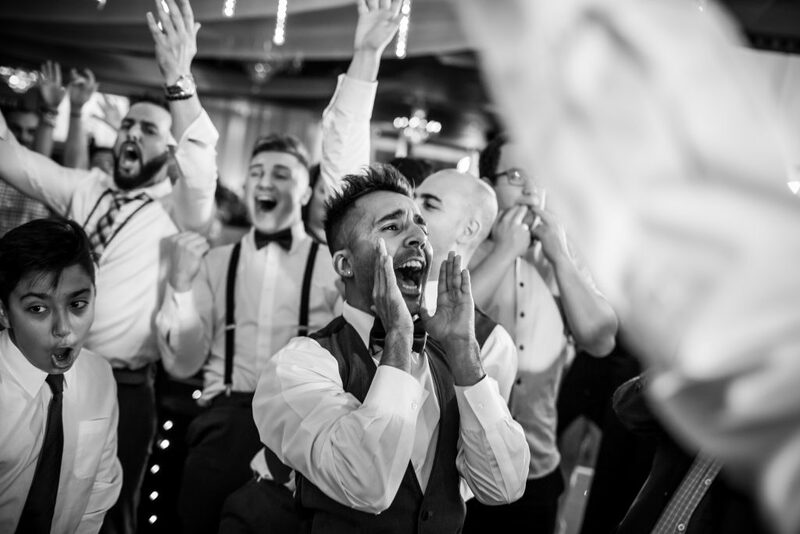 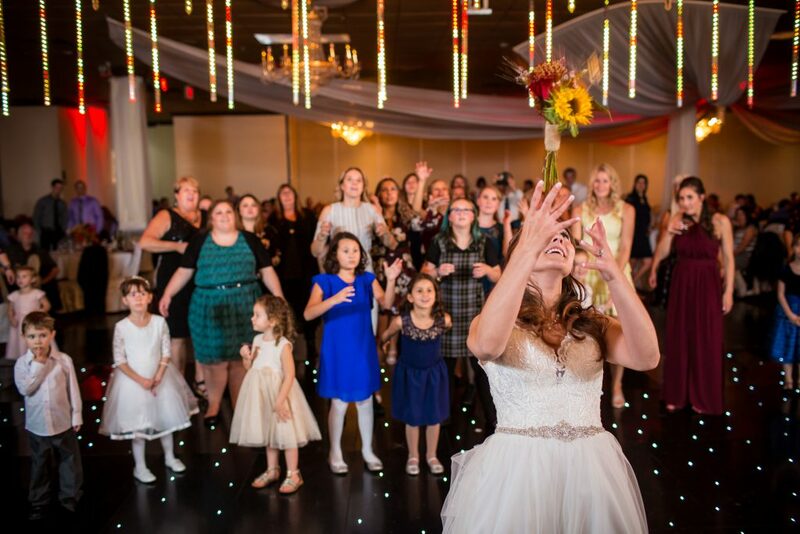 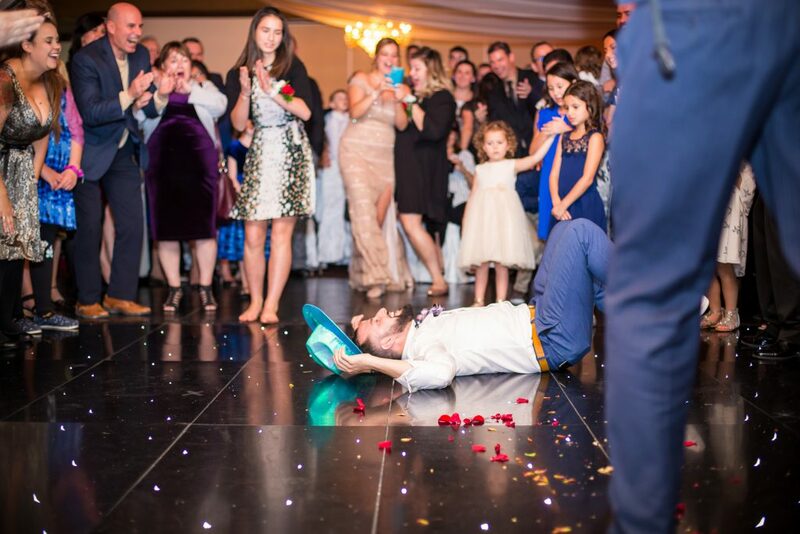 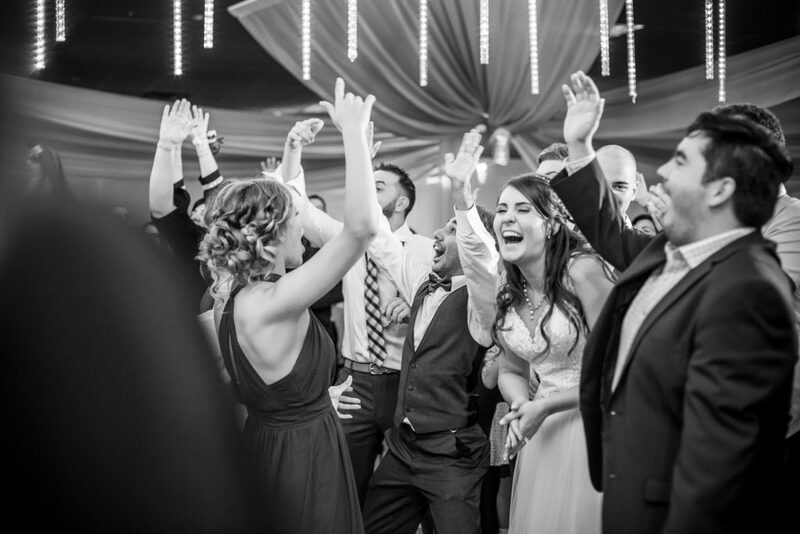 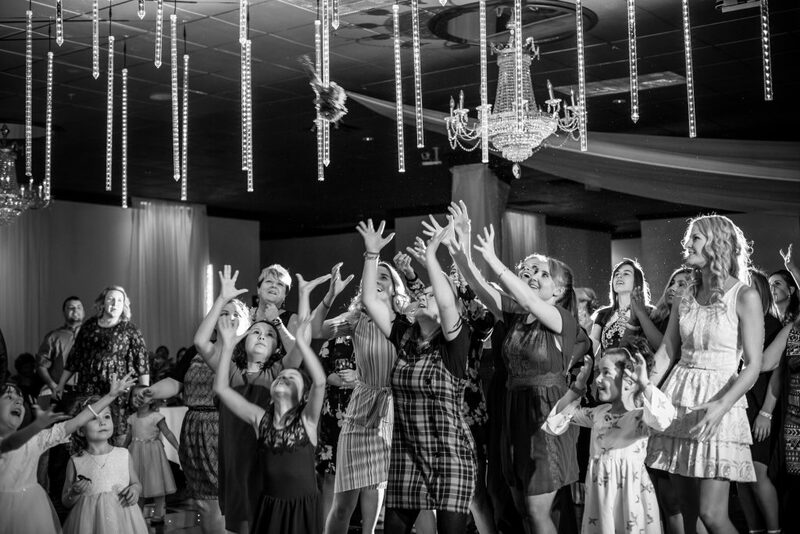 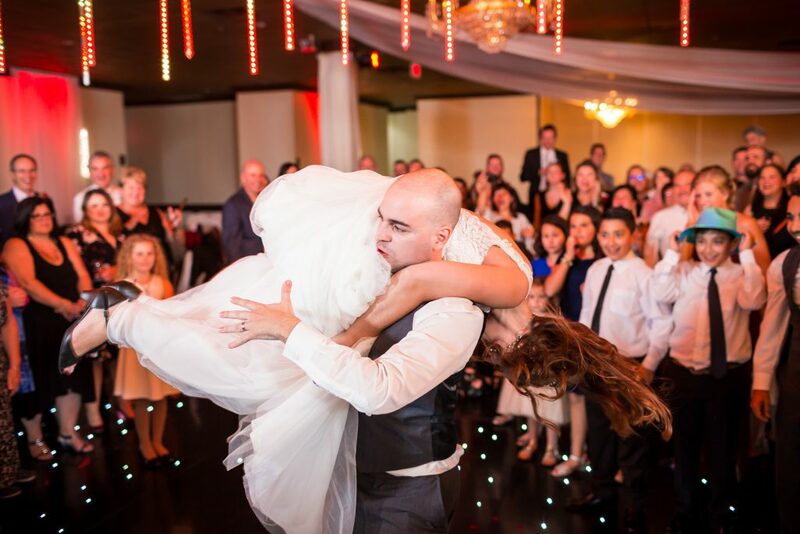 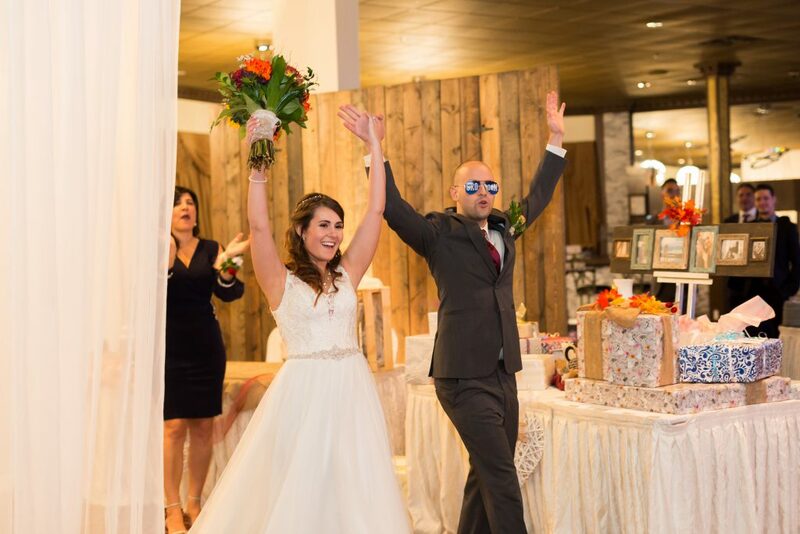 This was an epic celebration and our biggest wedding of the season! 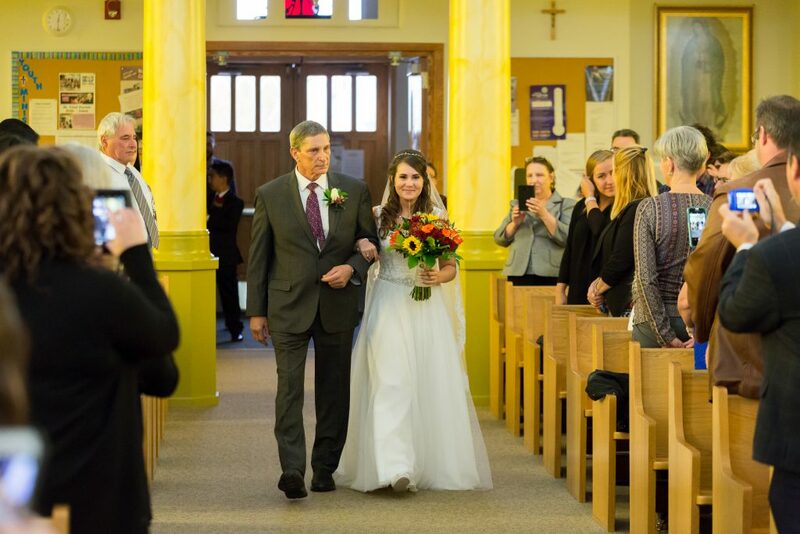 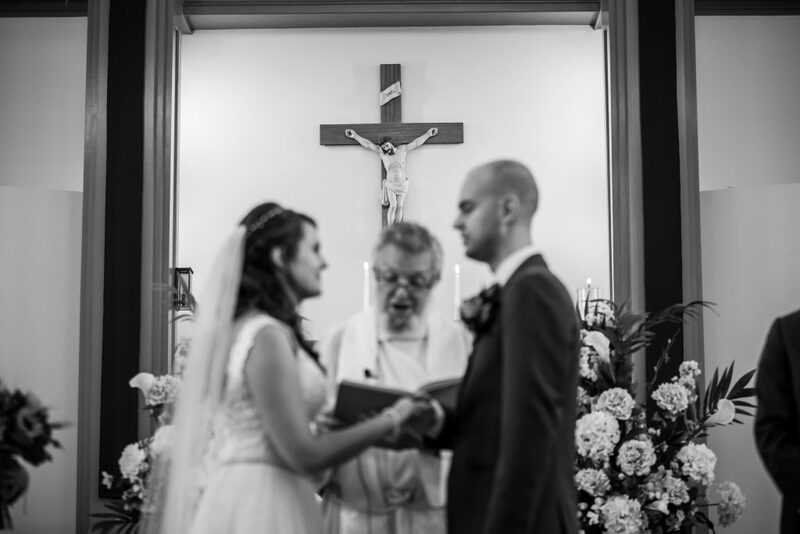 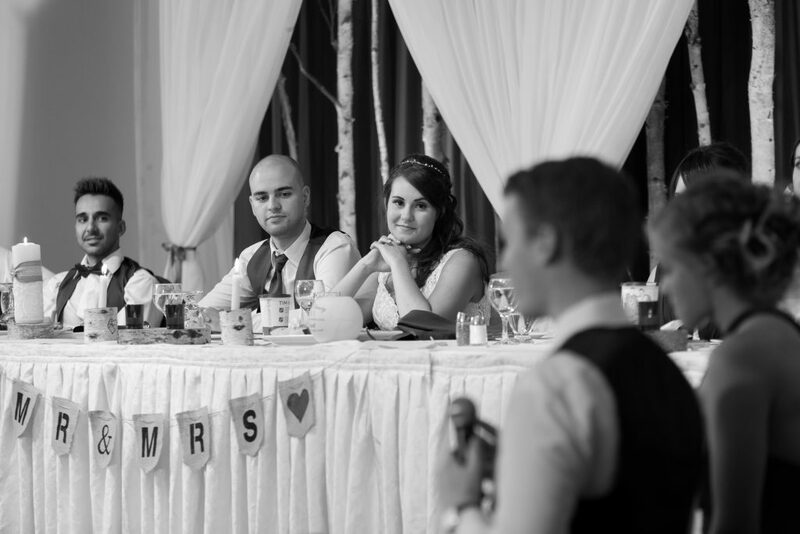 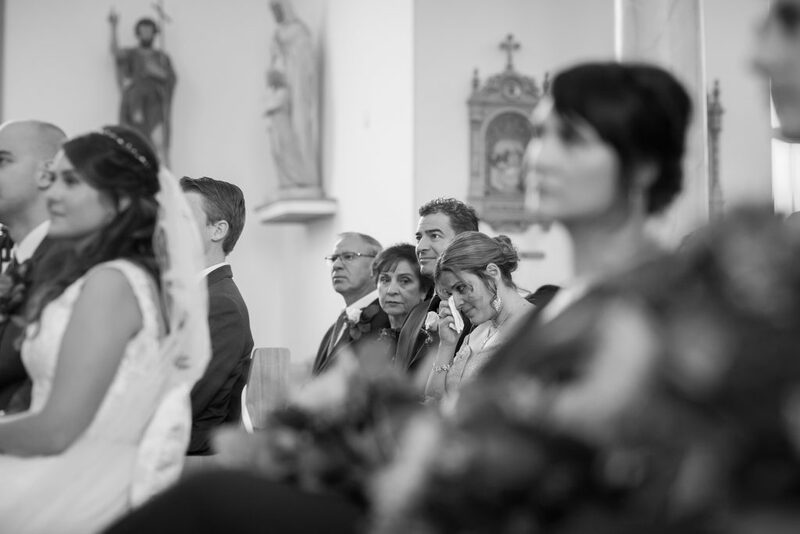 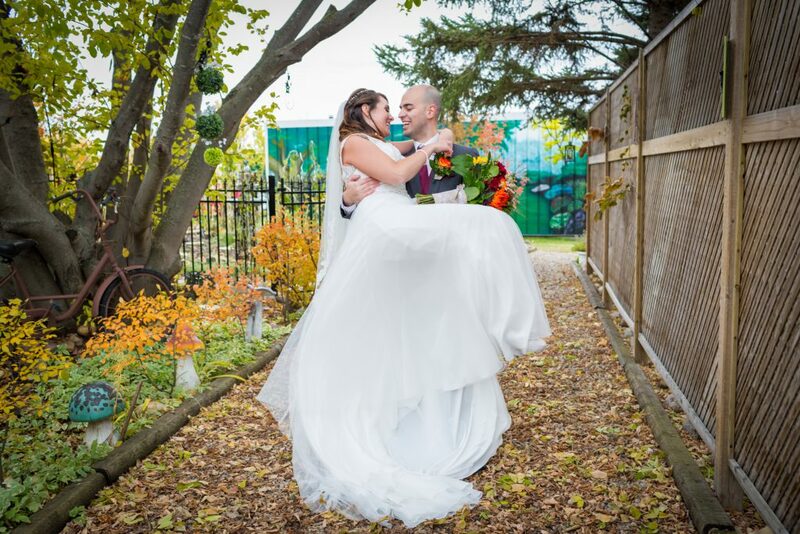 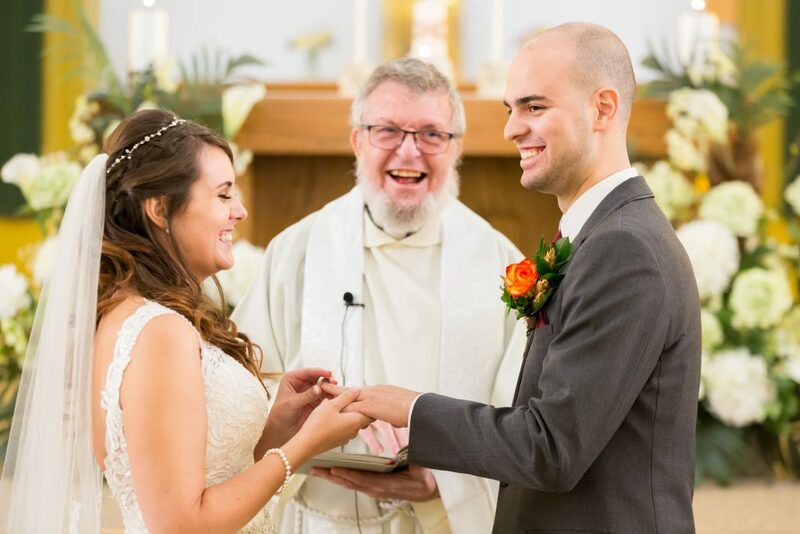 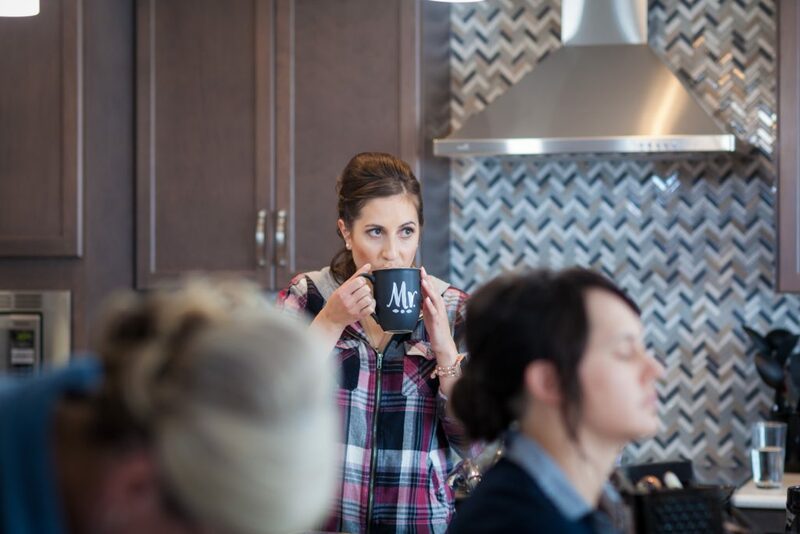 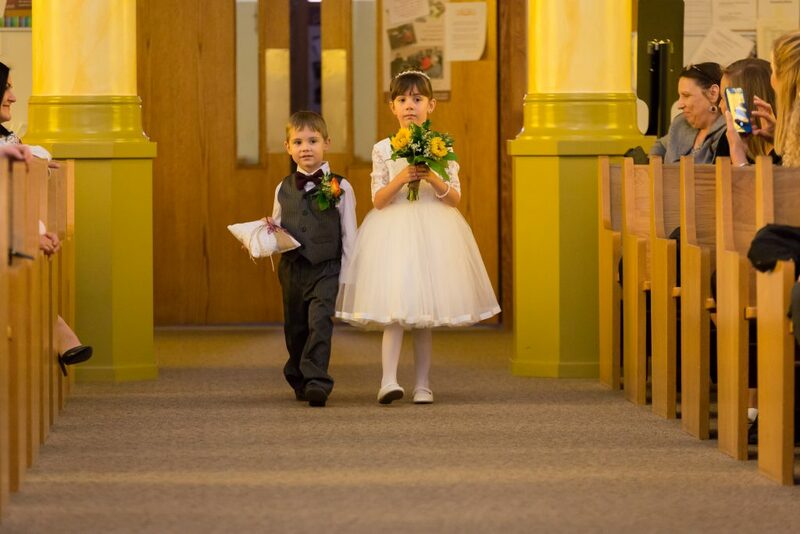 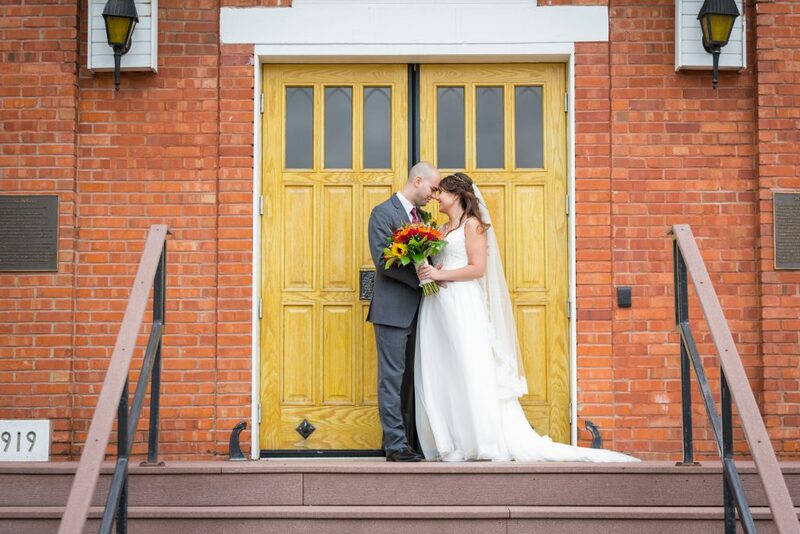 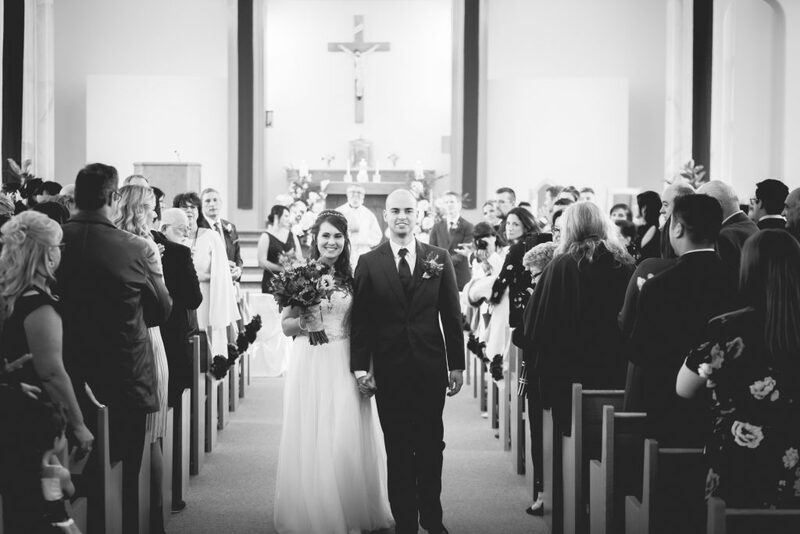 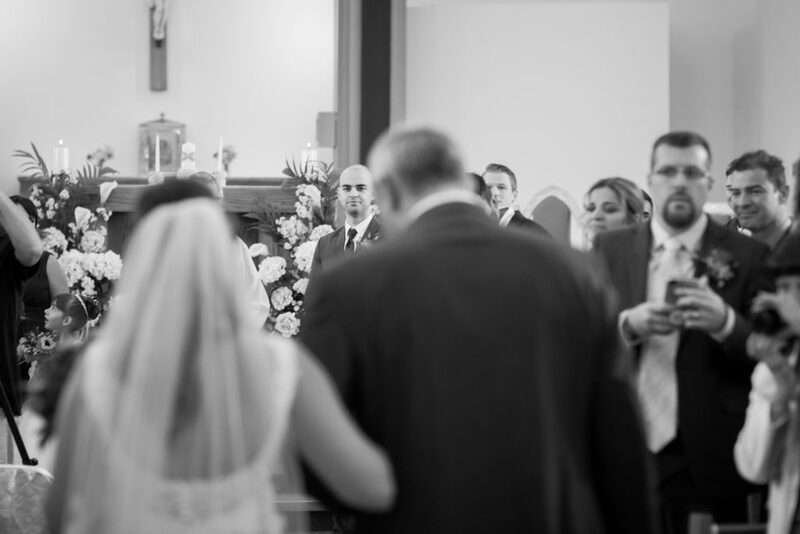 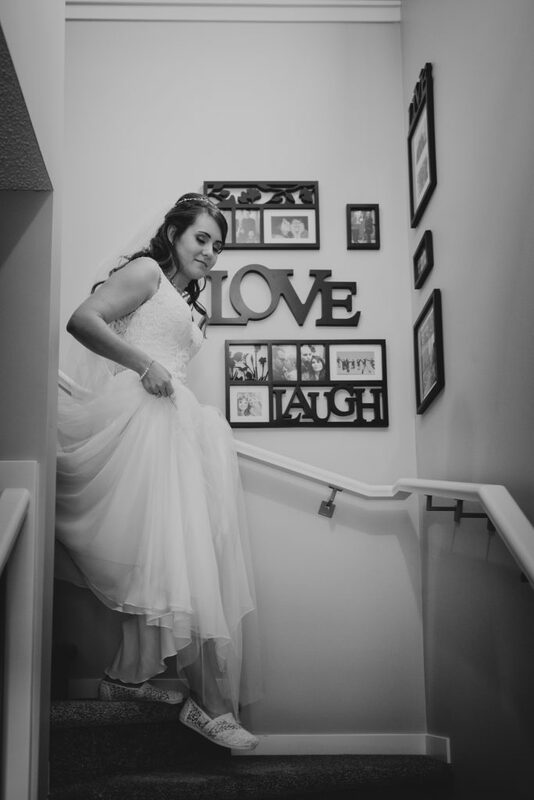 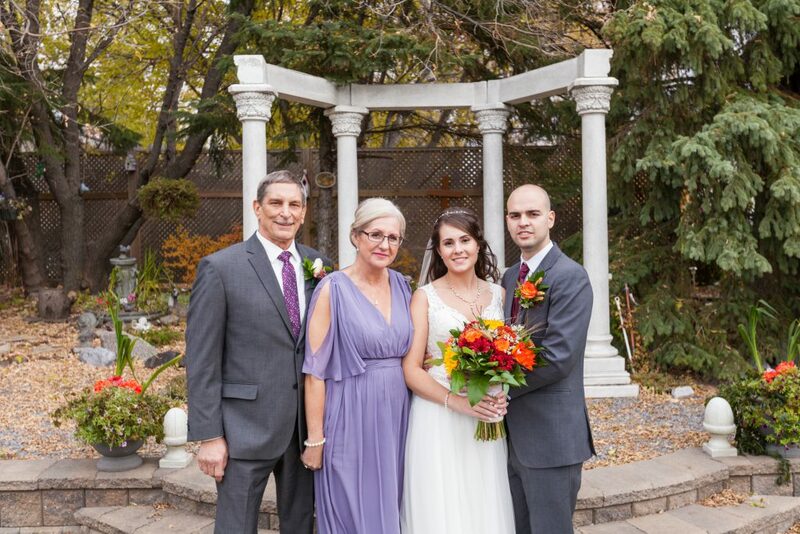 Angela and Christopher were married in Angela’s home church, the stunning St. Vital Parish in Beaumont, Alberta. 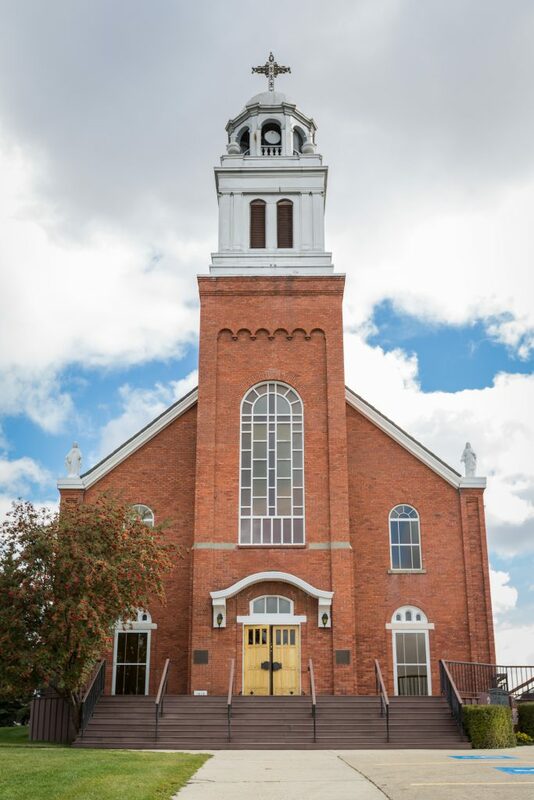 If you have ever had the opportunity to drive through Beaumont you will immediately recognize this big red brick church perched on the hill. 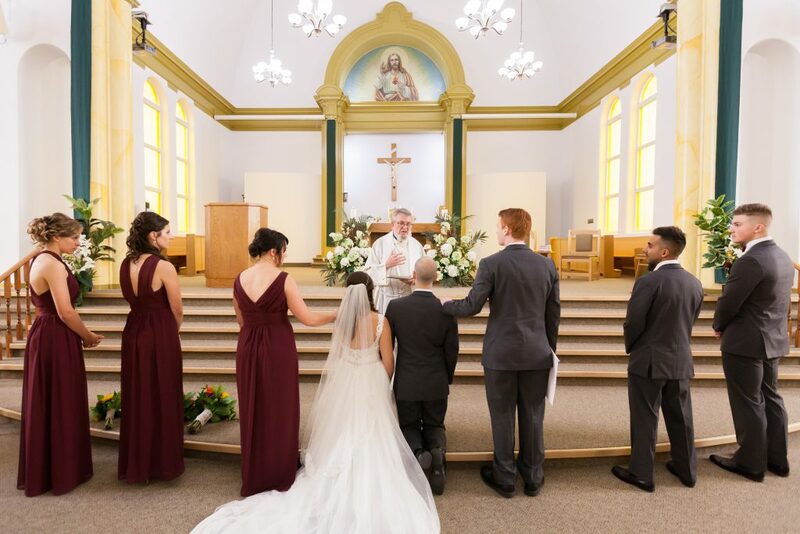 This beautiful historic church is as beautiful on the inside as it is on the outside. 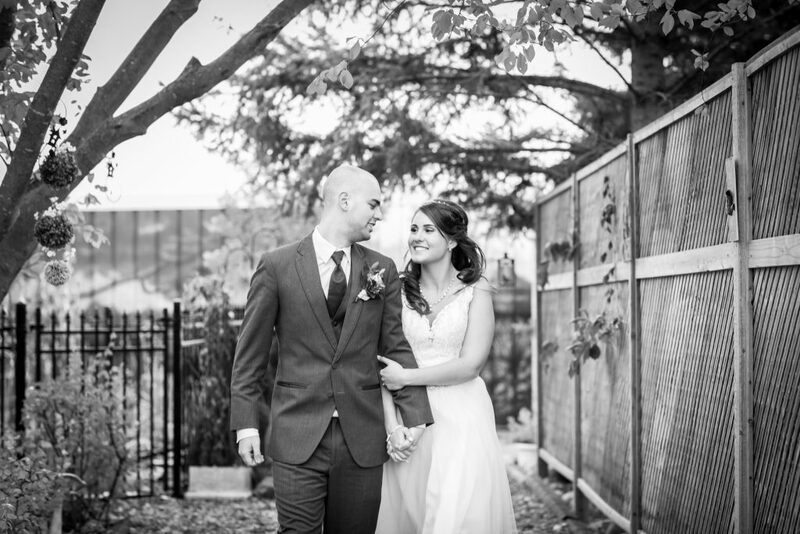 Wedding portraits were taken at Rainer Gardens. 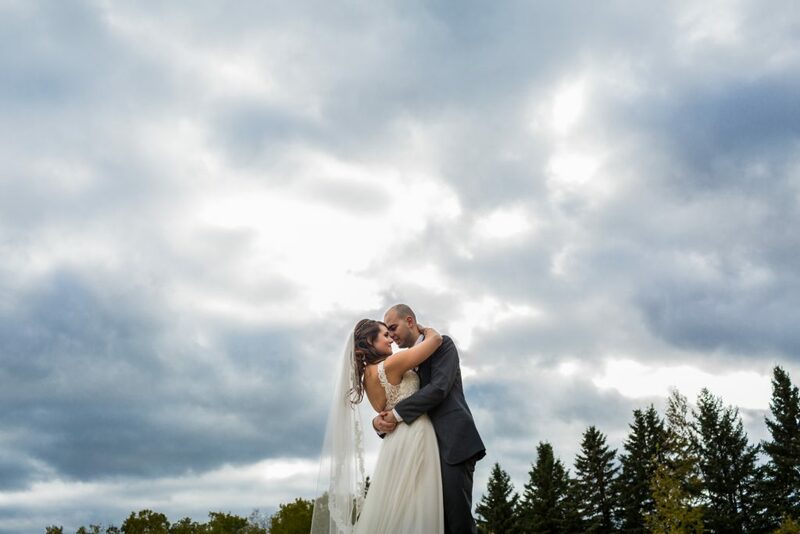 This gorgeous outdoor portrait venue is perfect for wedding photos. 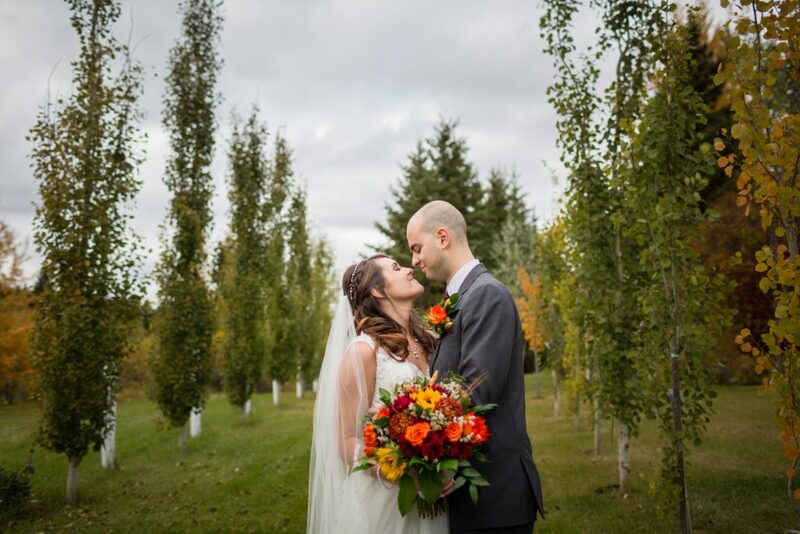 The gardens are hidden away in the back of a beautiful expansive acreage area, but well worth the journey. 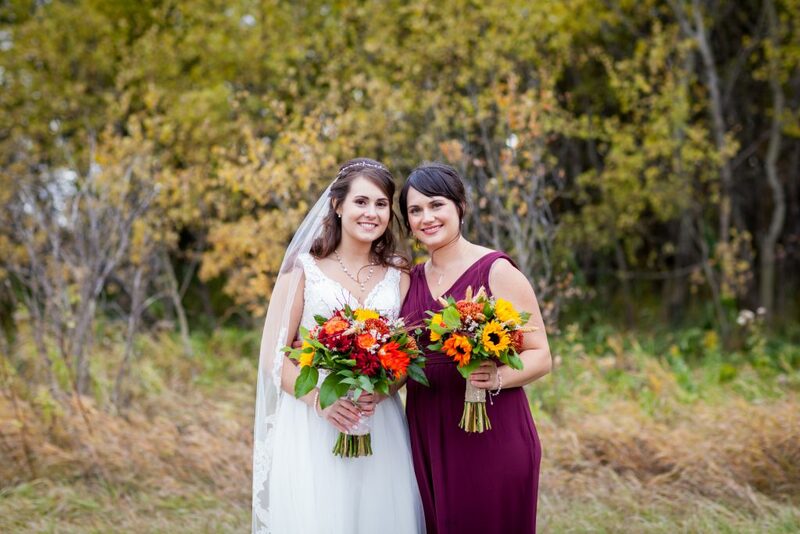 While many of the flowers were done for the season, the trees were just starting to turn a coppery-gold. 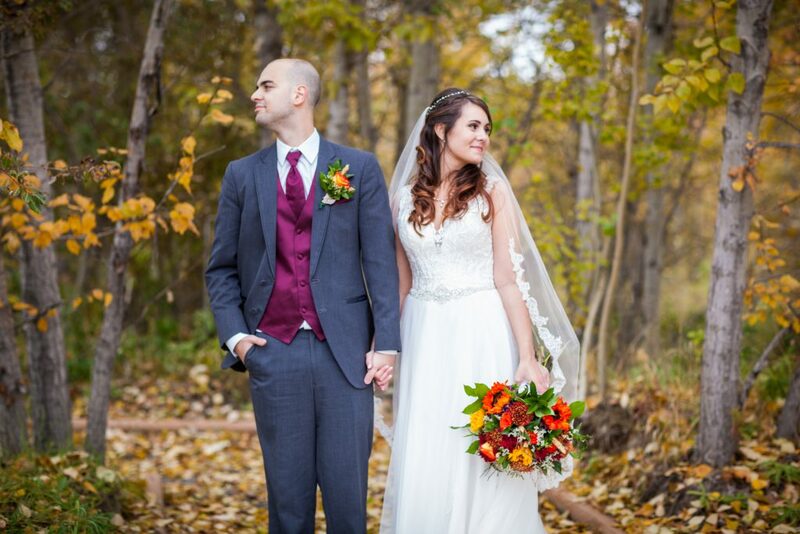 These colours made for a lovely and romantic autumn backdrop. 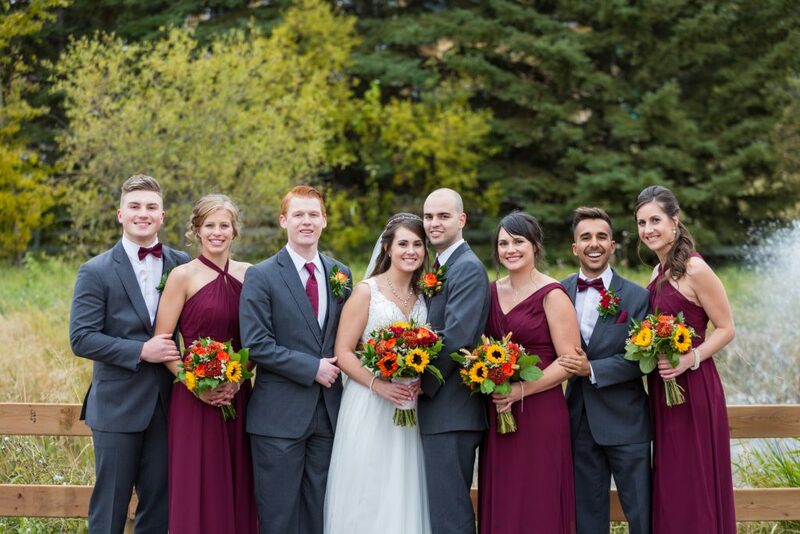 Angela and Chris’ burgundy wedding colours looked absolutely stunning. 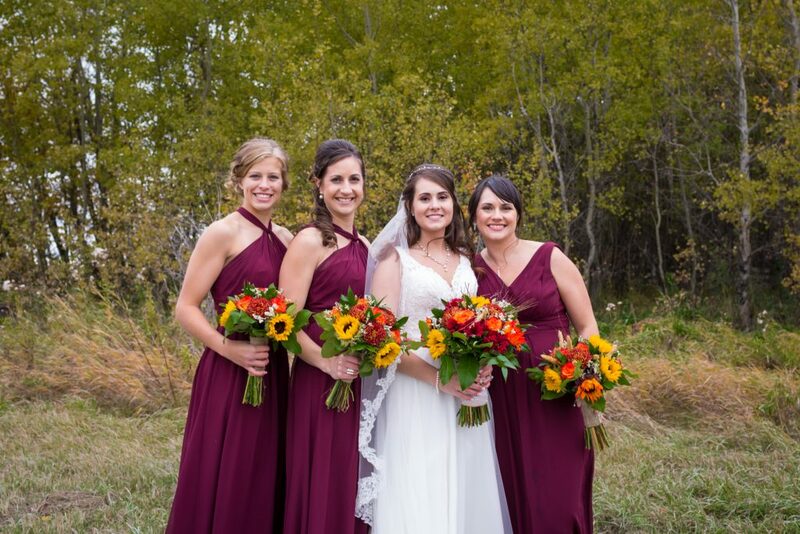 We would highly recommend burgundy and grey for a late autumn wedding. 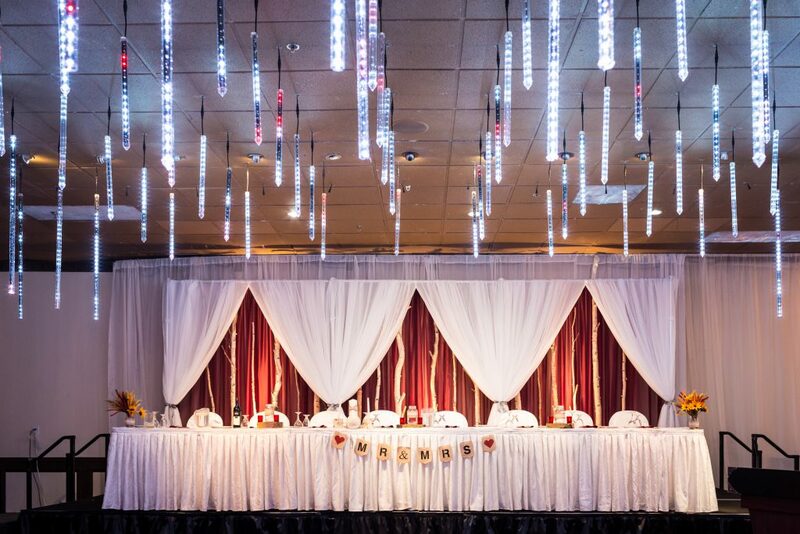 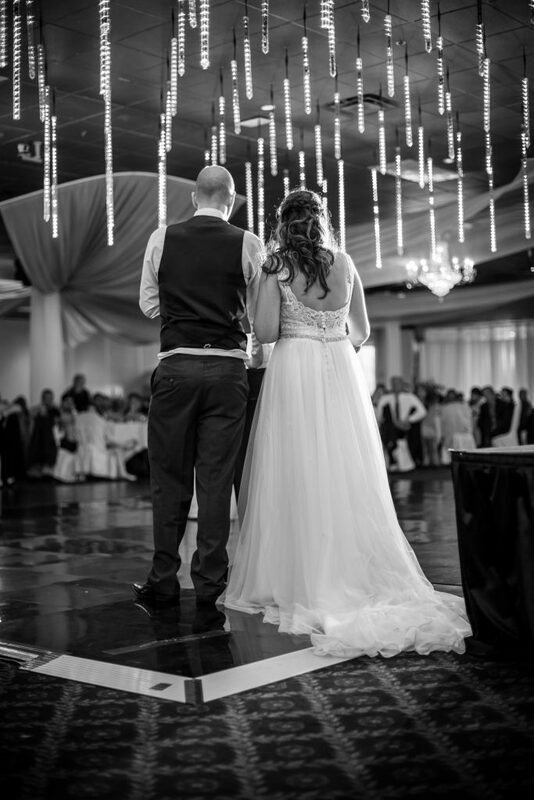 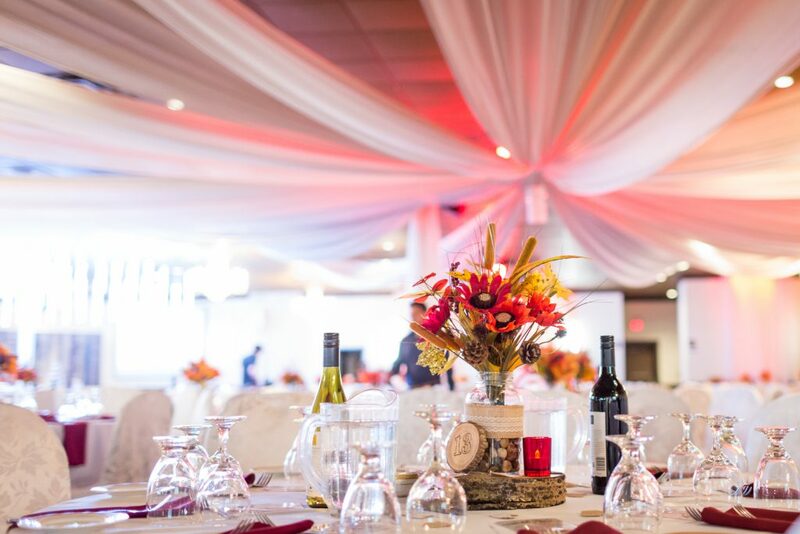 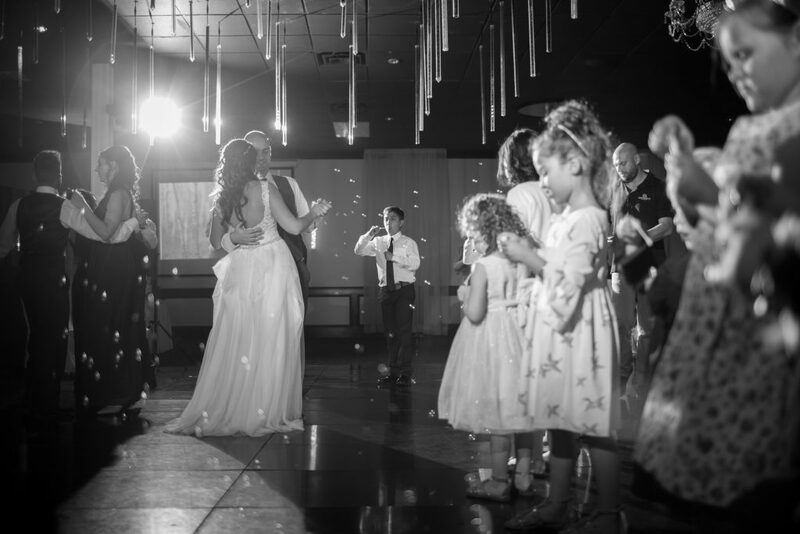 The Mirage Banquet Hall hosted the elegant wedding reception and dance party. 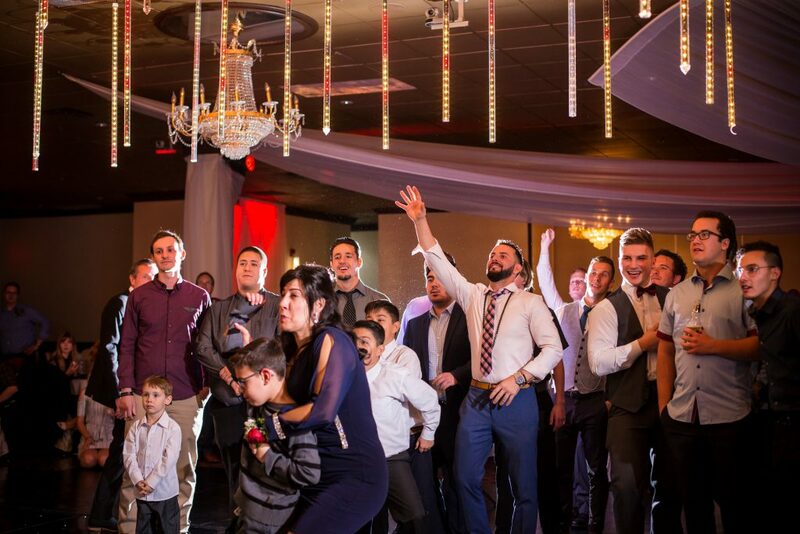 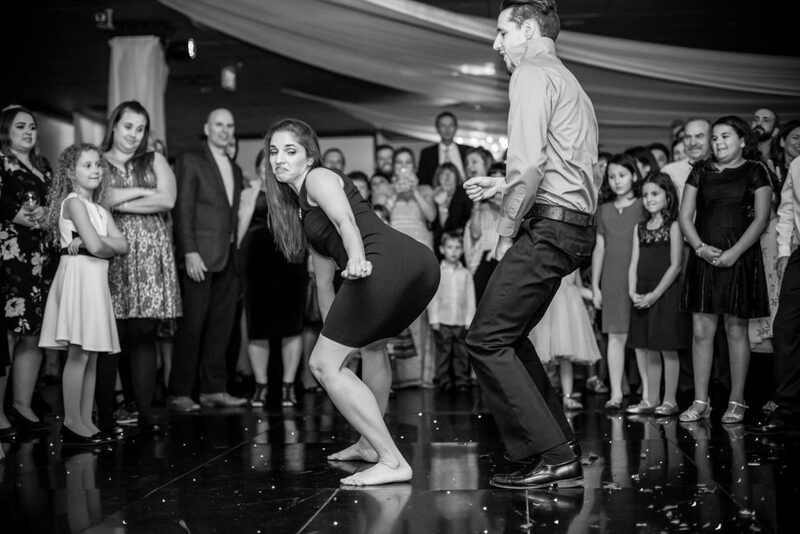 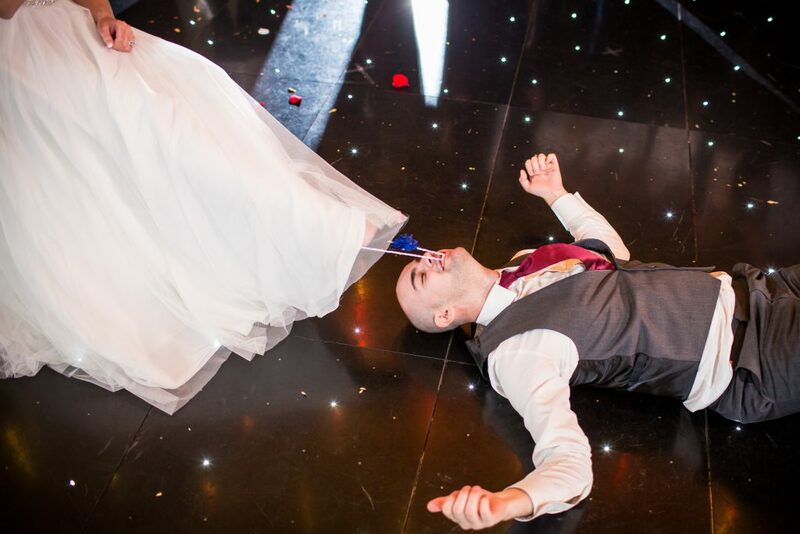 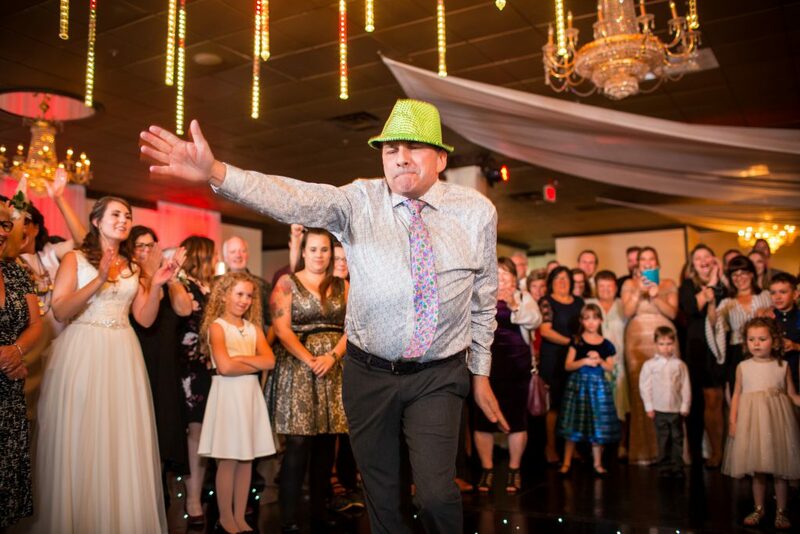 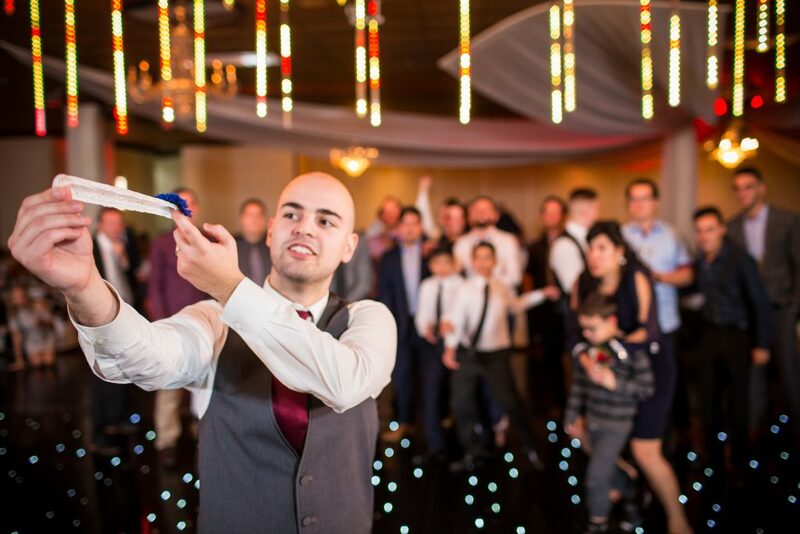 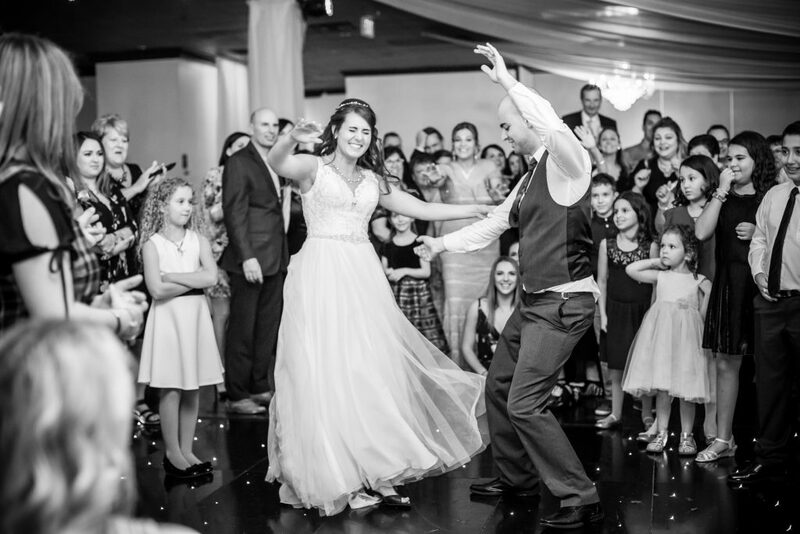 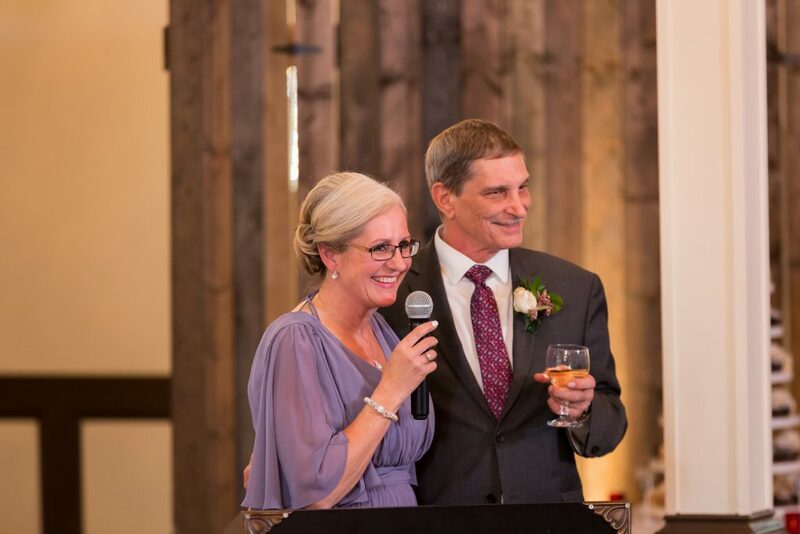 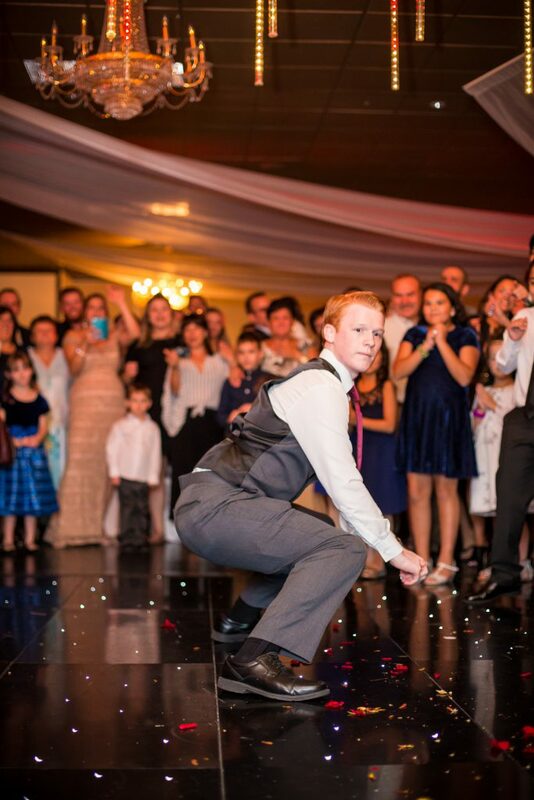 Guests were treated to an evening of heartfelt speeches, fun wedding games and an epic dance-off. 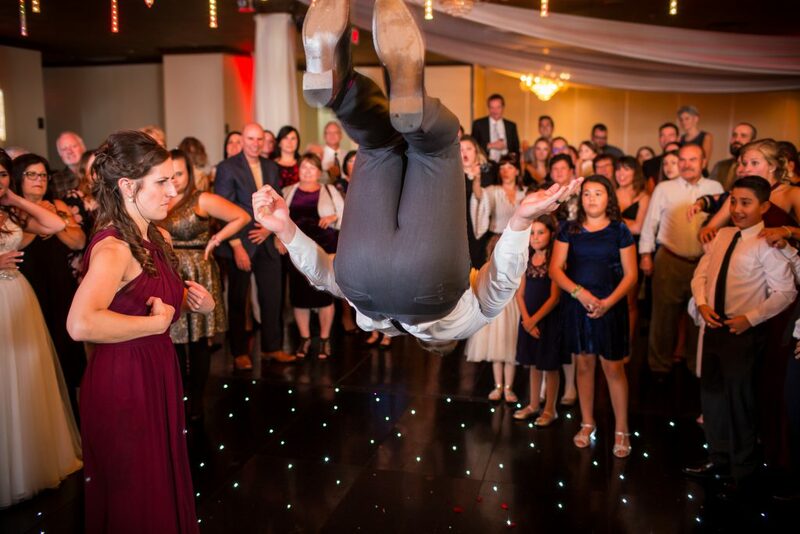 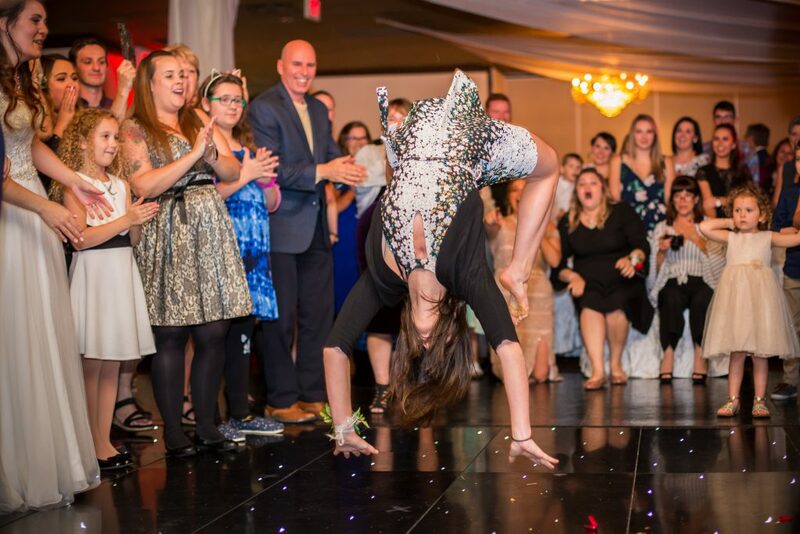 Angela and Chris’ guests strutted their stuff, showing off their impressive dance moves and acrobatic feats. 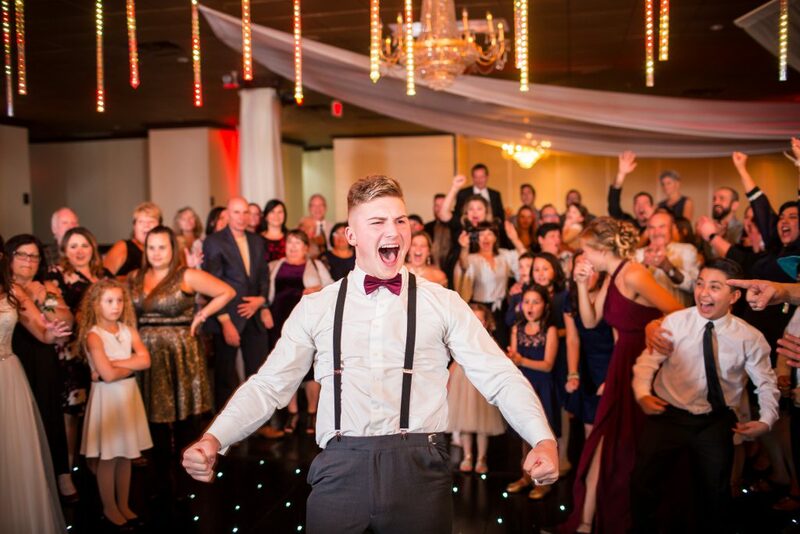 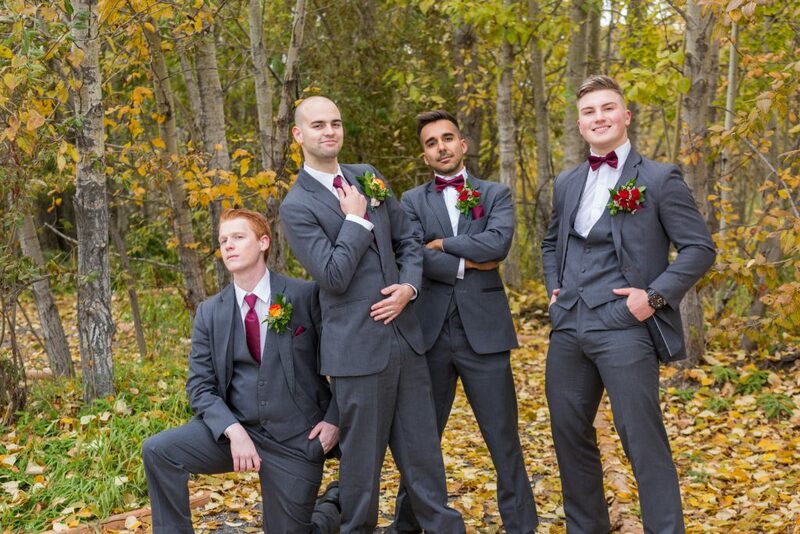 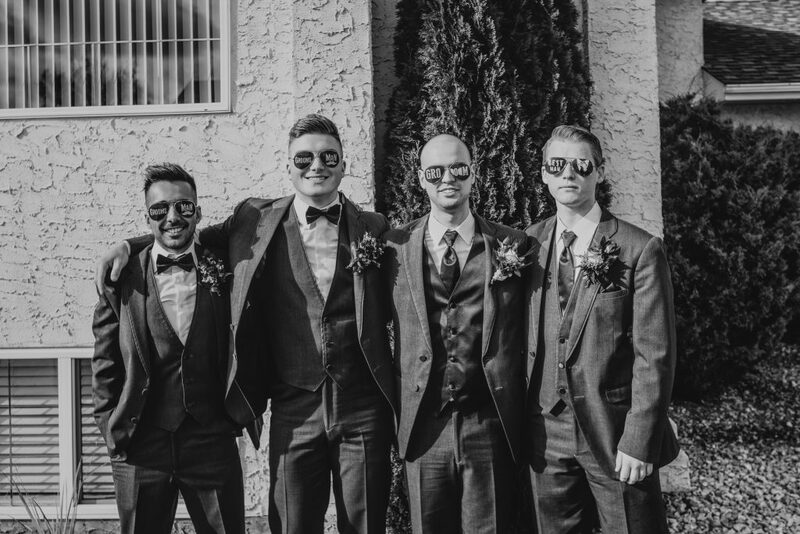 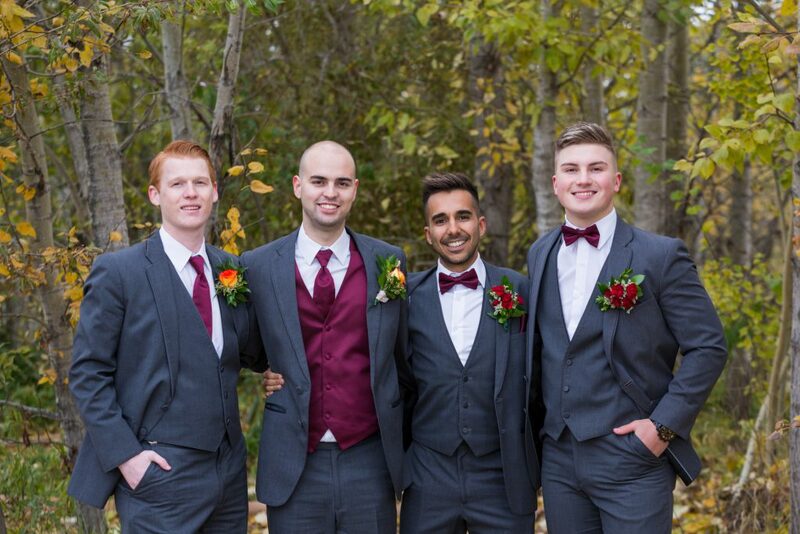 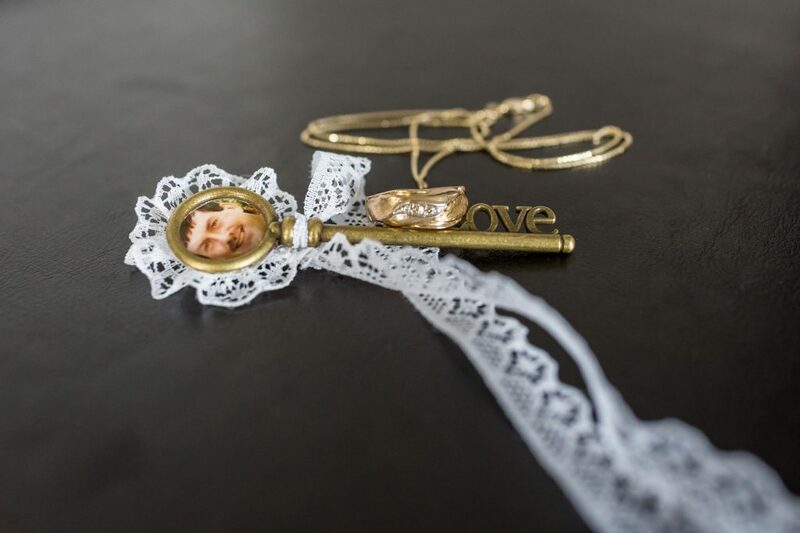 This wedding was a great big party and an absolute blast to be a part of! 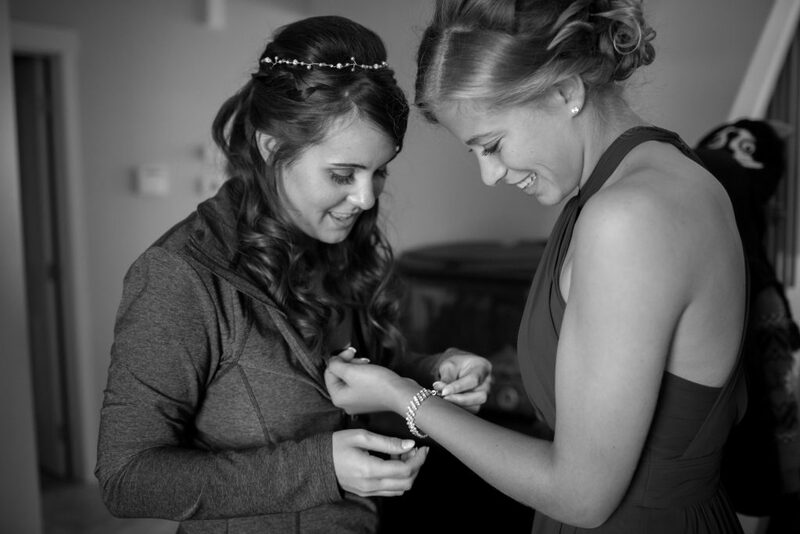 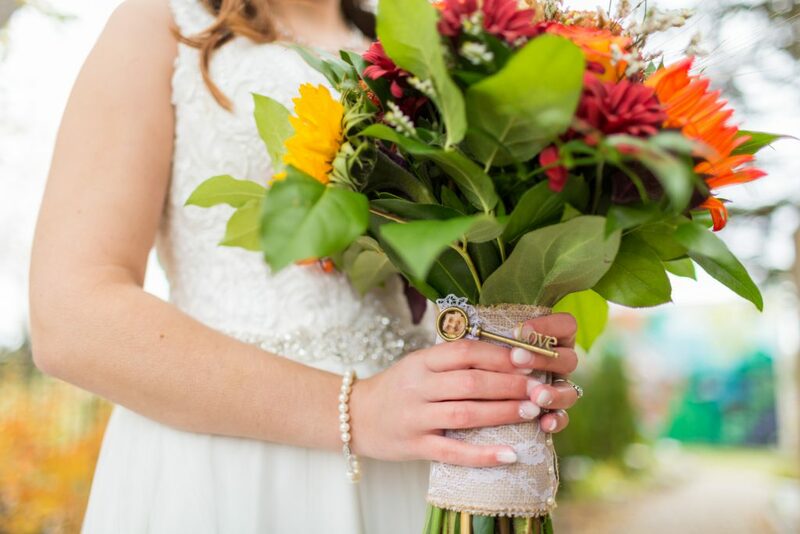 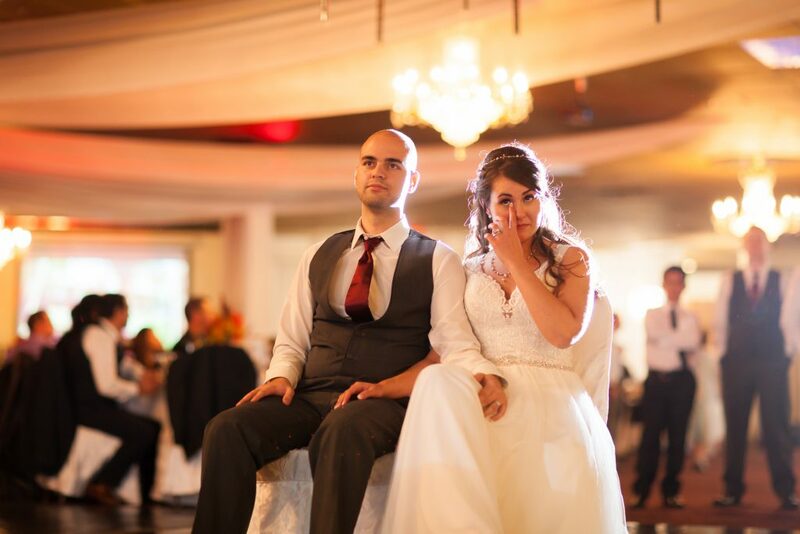 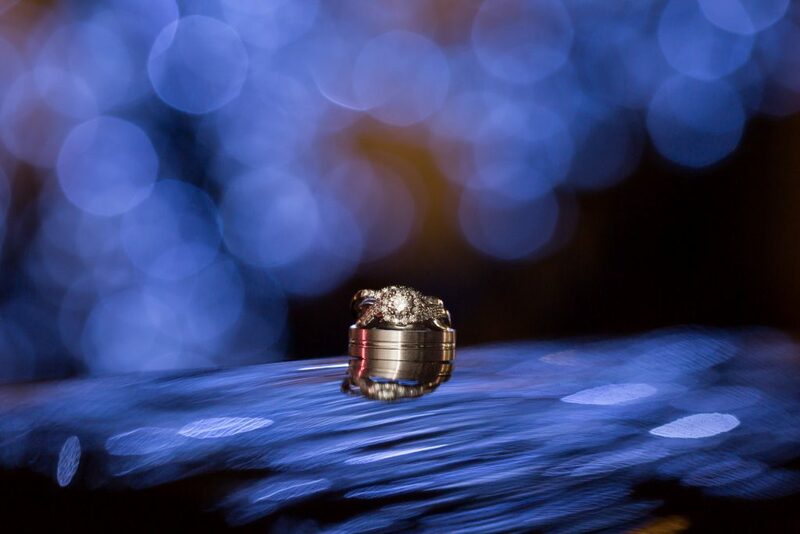 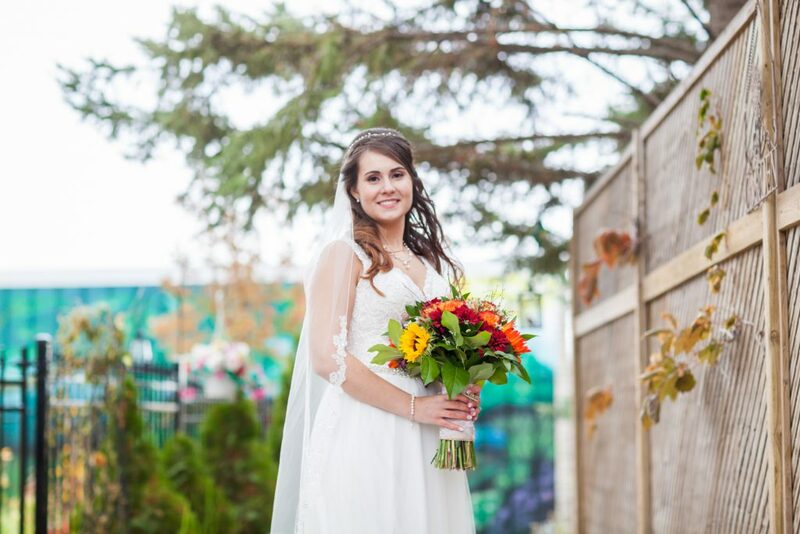 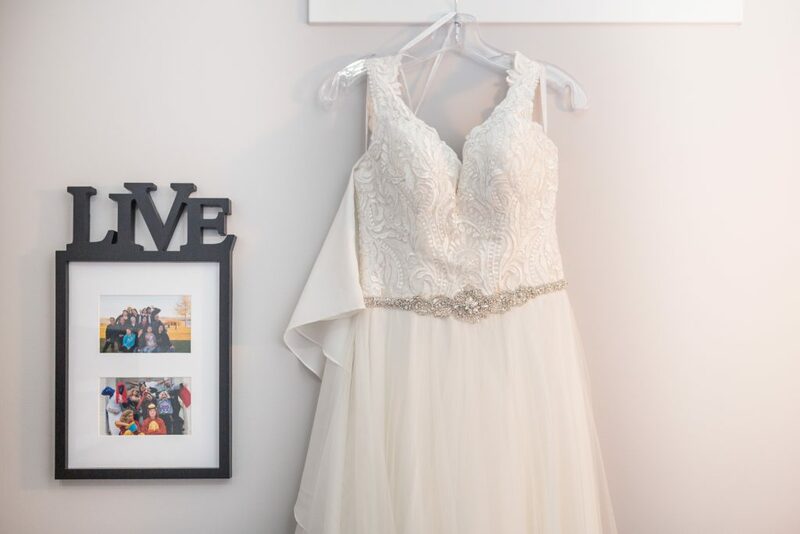 Thank you for inviting Deep Blue Photography to capture your gorgeous Rainer Gardens wedding.